Mayor plans partnership to revive Dudley Sq. Mayor Thomas M. Menino yesterday proposed moving the headquarters of the Boston School Department into a once-grand but now abandoned department store in the heart of Dudley Square, part of a broader plan to consolidate the city’s administrative buildings and revitalize a long-neglected area of Roxbury. In tackling the revitalization of the Ferdinand Building, a five-story, Baroque Revival structure built in 1895, Menino is trying to fulfill a promise that city and state leaders have been making for more than a decade to attract economic activity to Dudley Square by bringing government offices there. For years, Menino and state officials promised to move a state office, the Department of Public Health, into the vacant building as part of a $60 million plan. But Governor Mitt Romney scrapped those plans in 2004. That year, Menino announced plans to move the School Department to the long-dormant site. Four years later, he even held a ceremonial groundbreaking there and spoke of a new $80 million municipal building that would jump-start Dudley’s revitalization. Each time, the projects failed to materialize, and Menino alternately blamed Republican governors or the economy. The mayor’s latest effort, he said yesterday, would finally make the project a reality by using a public-private partnership to help manage the building’s reconstruction. It is part of a larger attempt to reduce the number of city administrative buildings from nine to four. But the centerpiece of the plan would be Roxbury. Under the plan, the city, which owns the Ferdinand, would take on $115 million in debt to rebuild it while preserving its elaborately carved limestone, marble, and brick façade. A private developer would advise the city on the design and construction, then manage the building and select commercial tenants for the ground floor. Construction could begin within a year and the building could be completed within three years. At that point, 400 School Department employees would be relocated there from their current headquarters on Court Street, near City Hall. In addition, the city would relocate the Fire Department headquarters from Southampton Street to upgraded offices at 1010 Massachusetts Ave. The old fire headquarters, along with four other city buildings, would be leased or sold. Unveiling the plan at the Boston Municipal Research Bureau’s annual luncheon at the Seaport Hotel, Menino struck a determined tone, openly mocking his critics while acknowledging there has been more talk than action about revitalizing Dudley Square. The mayor also has a history of unveiling and then abandoning bold development projects, such as his plans to build a 1,000-foot skyscraper in the Financial District and relocate City Hall to the South Boston waterfront. He insisted, however, that his Dudley plan, crafted with the help of Christopher M. Gordon, a real estate specialist at Harvard Business School, is realistic. 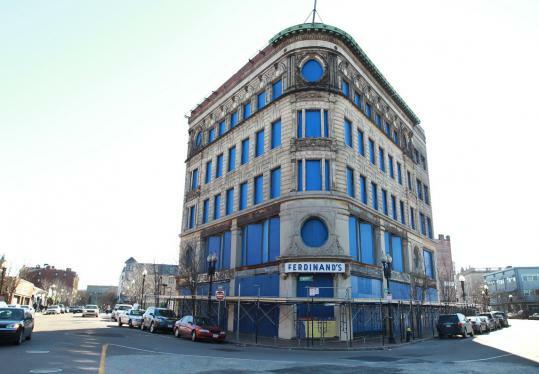 In addition to remaking the Ferdinand, which has been vacant for three decades, he promised to redevelop the site of the current Dudley Square police station, with the neighborhood’s new police station being readied for a summer opening. He also vowed to improve the Dudley branch of the Boston Public Library, and called on state officials to refurbish the hulking bus station in the middle of the square. Samuel R. Tyler, president of the research bureau, a business-backed watchdog group, said the mayor’s Dudley plan appears better developed than some of his past proposals. He said the bureau has been urging Menino to take advantage of Boston’s healthy credit rating to initiate construction projects now, so they will be ready when the real estate market recovers. A $115 million project, he said, would not burden the city with intolerable debt, particularly if it can raise money by selling or leasing the five administrative buildings it is vacating. Community leaders, wary of past promises to reinvigorate Dudley, expressed cautious optimism about the mayor’s latest proposal. “It’s been a long time coming,’’ said Sarah-Ann Shaw, a lifelong Roxbury resident and former television reporter who serves on a Dudley revitalization committee. “If you’re going to attract more businesses, there’s no reason why Washington Street around Dudley should not resemble Centre Street in Jamaica Plain or Harvard Avenue in Allston-Brighton or Broadway in South Boston,’’ she added.